Caramel-Coated Spiced Nuts - Jill Ruth & Co.
A couple of weeks ago, I decided we were going to eat more salads as main dishes and went looking for a steak salad recipe. I found Pioneer Woman's Big Steak Salad recipe. I ditched the idea of homemade onion rings right off. That would take a crazy amount of time! 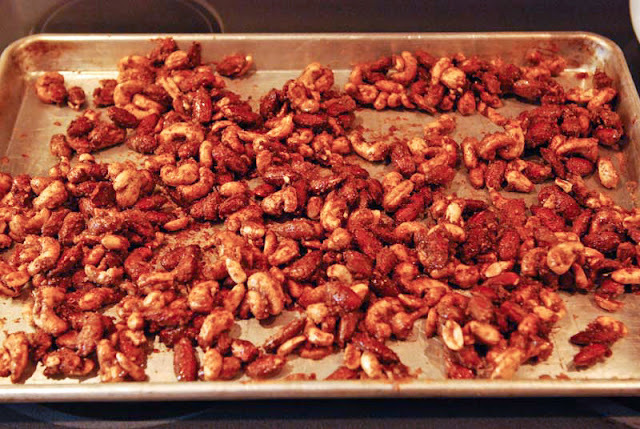 Then, I opted to use a tried and true spiced nut recipe I had clipped years ago from Taste of Home instead of her recipe for the pecans. I did however, use the dressing recipe she had. It was okay, but I'd like to hear from anyone with a perfect vinaigrette recipe for me! I'm telling you the steak combined with the blue cheese and spiced nuts atop the mixed greens was sooooooo good. I didn't take any pictures. Too bad too, because we ate it on vintage green trimmed diner plates. Big happy smile! 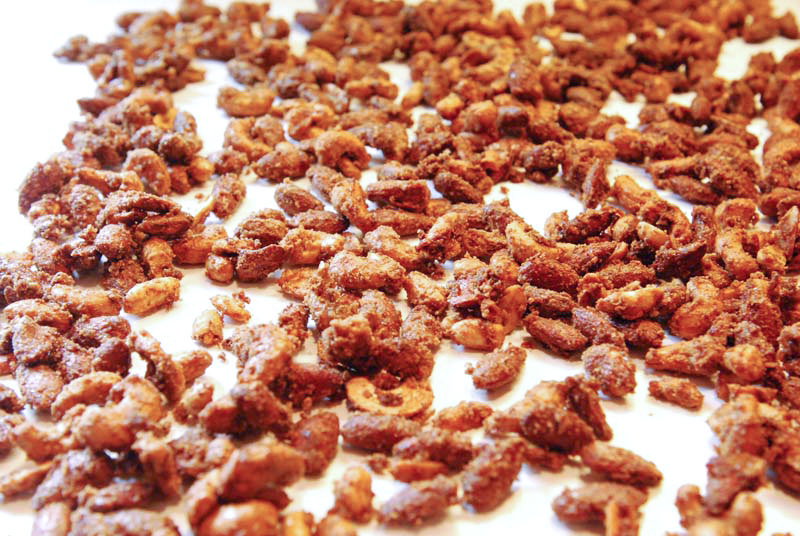 I do however want to share the spiced nuts recipe with you. These make a great gift or now we know, a great addition to a salad!! First, whisk 2 egg whites with 1 tsp. of water. 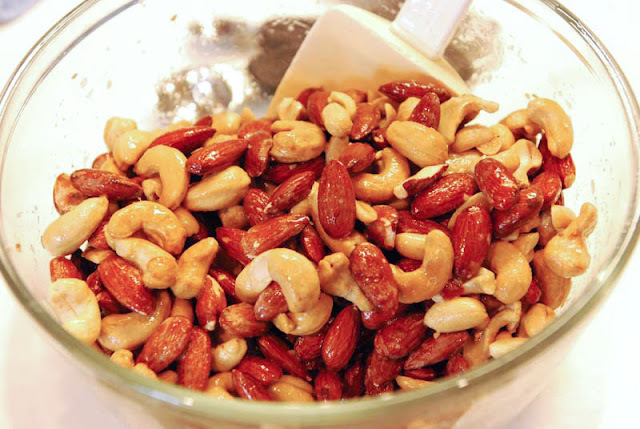 Add 4 cups of nuts of your choice. 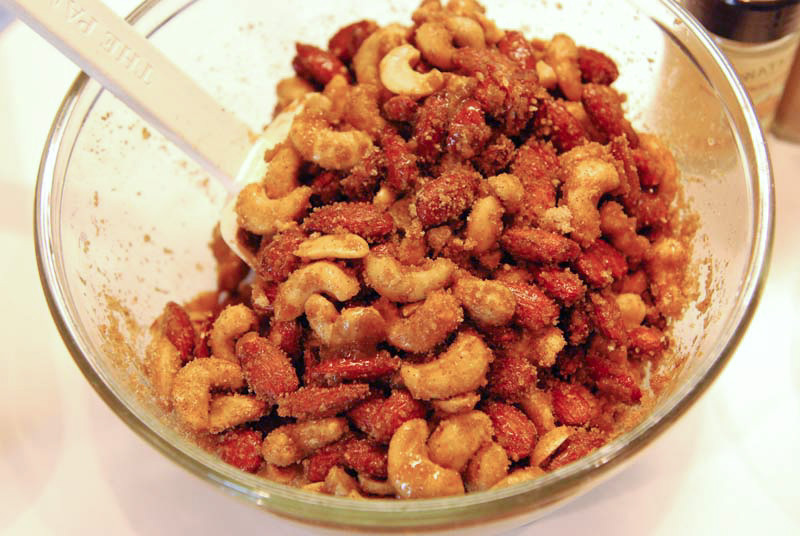 I used almonds, cashews, and peanuts this time, but have used pecans before too. 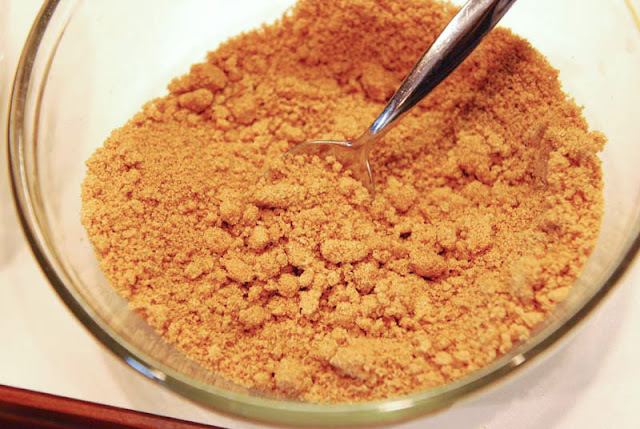 In a separate bowl, mix 1 cup brown sugar, 3 tsp. 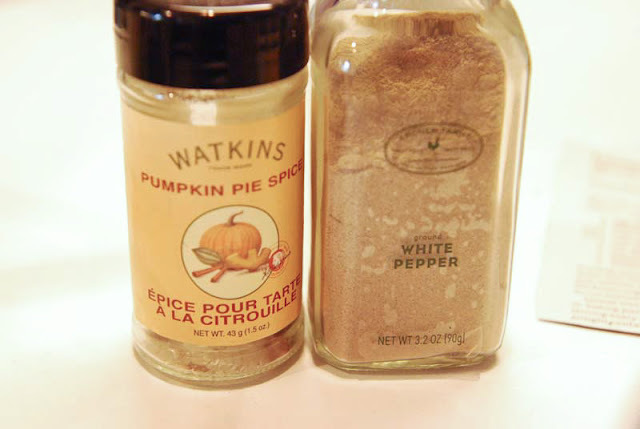 pumpkin pie spice, and 1 tsp. white pepper. It seems to me that white pepper is much finer than regular pepper so that may be why the recipe calls for it. Add the sugar and seasonings to the nuts and stir to evenly coat. Spread out on a greased baking sheet and bake 30 minutes at 325 degrees. Stir at 10 minute intervals. The coating begins to firm and harden. Yum. 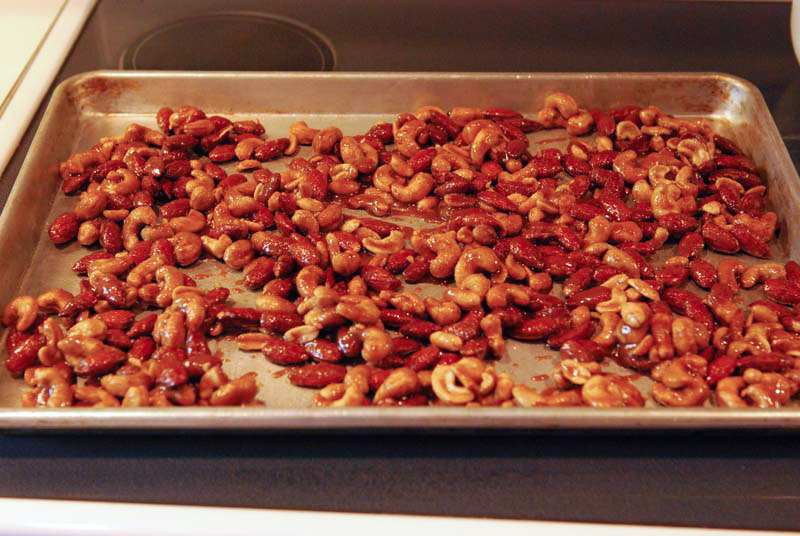 Spread the nuts out on waxed paper or parchment to cool and break apart the pieces that are stuck together. If tightly covered they will keep for quite awhile. 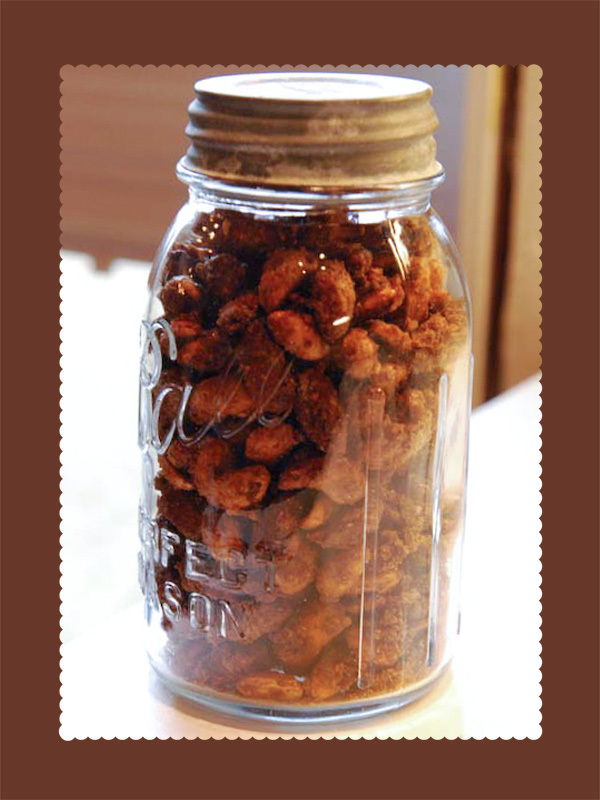 These nuts make a great hostess gift, teacher gift, or thinking of you gift! I use seasonal cellophane bags to present them in too. 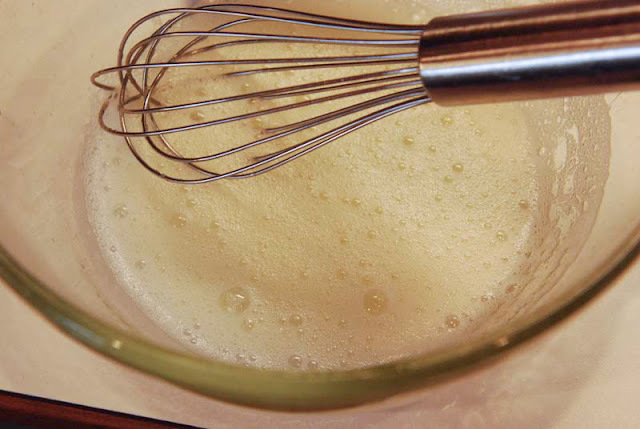 Whisk the egg whites and water until foamy. Add the nuts and stir to coat. Combine the brown sugar, pie spice and pepper. Add to the nut mixture and stir to coat. Spread into a greased baking sheet. Bake at 325 degrees for 30 minutes, stirring every 10 minutes. 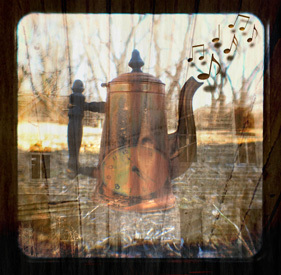 Cool on waxed paper. Give them a try and let me know what you think. Mmm. 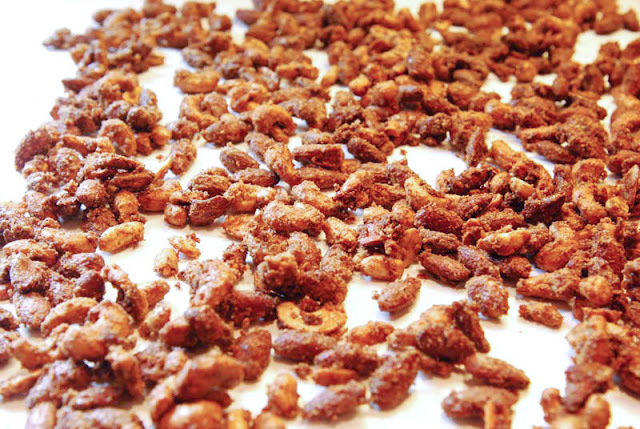 I love spiced nuts. This one is different than what I've made before. Yum!